A father-daughter duo have teamed-up to share their personal fiction stories with the public. “The Empress Angelina’s Quest,” written by authors Charles & Irene Nickerson, is the third book an adventurous science fiction which focuses on the importance of honor, faith, friendship, love and the fighting of good against evil. In ‘Quest,’ Beary and his friends, Pompey, Artemus, Caesar and Ben team up to complete the construction of a new warship. Unbeknownst to the group, evil forces are plotting to invade the Bearilian Society, resulting in the team coming together in the ultimate battle of good against evil. 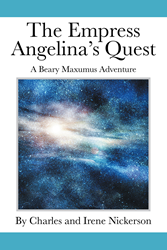 An action-packed science fiction full of adventure, “The Empress Angelina’s Quest: A Beary Maxumus Adventure” is a fun read while teaching children and teenagers the importance of true friendship. Charles Lansford Nickerson has a Masters of Arts in History from the University of Northern Colorado and a BS in History from Iowa State University. He is also a Veteran of the United States Air Force, where he served as a Missile Combat Crew Member. He also taught History in Christian Schools for 10 years. He has previously published two acclaimed Poems. Irene Jean Nickerson is a graduate of Ankeny Christian Academy in Ankeny, Iowa. She is a graduate of Central College in Pella Iowa.